There are 3 of us. Myself, my wife and her sister who is in a wheelchair. We had cabin 12170. Excellent cabin with lots of room for the wheelchair. I slept on the couch which was made into a single bed. It was surprisingly comfortable. 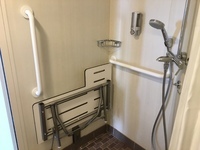 Lots of room in the bathroom and shower was great for disabled. 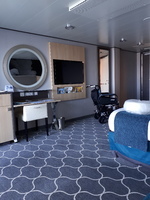 Harmony is a busy ship with over 6200 guests. We decided to have breakfast in the main dining room which was on the lower MDR every morning. Excellent breakfast. We choose the line to be served but we could still use the buffet. Great service. We did go up to the Windjammer Buffet to look around. It was crowded but manageable. Our Main Dining Room was The Silk on the top level. We had my time dining but where able to go at the same time to the same table and waiter every night. I liked the variety and the quality of the meals was exceptional. We did try the other "free" eateries (I liked the Hot Dogs!) Johnny Rockets was good. The Solarium Restaurant had Kosher Food for this cruise as there was a large Jewish group on board. I learned a great deal about Kosher Food on this cruise. We parked ourselves in the Solarium bottom level every day. The pool was just too busy for a wheelchair. Solarium was quiet and relaxing. Went ashore in St Maarten and walked to Great Bay Beach area. I pushed the chair and it was only about 15 minutes. Great Board Walk buy 5 ships where there so a vey crowded beach. Did not go ashore in San Juan. Labadie was good. We were able to use a beach wheelchair and although it was crowded we had no trouble getting three loungers in the shade. Debarkation was easy but crowded. we were going to a hotel after so a cab was actually easy to get. Harmony was a great cruise. We liked Grease and Columbus. The skating show was well done although I had trouble following the story line. The Fine Line water show was good but delayed twice. We watched it from the level at the Rock Climbing Wall. Great view. Miller Lite was $9.99 a can. I could not buy a package since everyone in the Cabin has to have one. 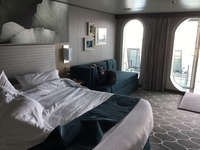 Probably will not cruise on such a large ship again but was good experience. There are 3 of us. Myself, my wife and her sister who is in a wheelchair. We had cabin 12170. Excellent cabin with lots of room for the wheelchair. I slept on the couch which was made into a single bed. It was surprisingly comfortable. 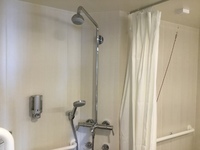 Lots of room in the bathroom and shower was great for disabled. 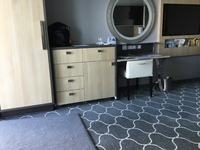 Harmony is a busy ship with over 6200 guests. We decided to have breakfast in the main dining room which was on the lower MDR every morning. Excellent breakfast. We choose the line to be served but we could still use the buffet. Great service. We did go up to the Windjammer Buffet to look around. It was crowded but manageable. Our Main Dining Room was The Silk on the top level. We had my time dining but where able to go at the same time to the same table and waiter every night. I liked the variety and the quality of the meals was exceptional. We did try the other "free" eateries (I liked the Hot Dogs!) Johnny Rockets was good. The Solarium Restaurant had Kosher Food for this cruise as there was a large Jewish group on board. I learned a great deal about Kosher Food on this cruise. We parked ourselves in the Solarium bottom level every day. The pool was just too busy for a wheelchair. Solarium was quiet and relaxing. Went ashore in St Maarten and walked to Great Bay Beach area. I pushed the chair and it was only about 15 minutes. Great Board Walk buy 5 ships where there so a vey crowded beach. Did not go ashore in San Juan. Labadie was good. We were able to use a beach wheelchair and although it was crowded we had no trouble getting three loungers in the shade. Debarkation was easy but crowded. we were going to a hotel after so a cab was actually easy to get. Harmony was a great cruise. We liked Grease and Columbus. The skating show was well done although I had trouble following the story line. The Fine Line water show was good but delayed twice. We watched it from the level at the Rock Climbing Wall. Great view. Miller Lite was $9.99 a can. I could not buy a package since everyone in the Cabin has to have one. 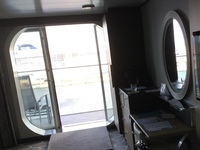 Probably will not cruise on such a large ship again but was good experience. See review above. 12170 is a great accessible cabin. I will try to include Pictures.